Rats! I nearly forgot about the Prairie Points. And how does another month go by so fast? We have had the most gloriously sunny days for more than a week. The last couple of days, however, have been record-breaking and are just a little too warm for us mild-weathered souls. Never-the-less, I will not complain because it is supposed to be cool and cloudy again by the weekend. If you want to add Prairie Points to your finished Medallion Quilt, there is a lot of information floating around on the Internet. This is what I would do if I was going to add them to my quilt. I like the look where the Prairie Points are NOT overlapping, but just meeting at each end. So, if you have finished with Border 12 and all those Half-Square Triangles, and your finished border width is 2 1/2″, you are now ready for the Prairie Points. I would also make them a finished size of 2 1/2″ wide, the same as the final border. 1. Cut (140) 3″ x 3″ squares of a variety of fabrics. You will need approximately 1 yard total of fabric. 2. 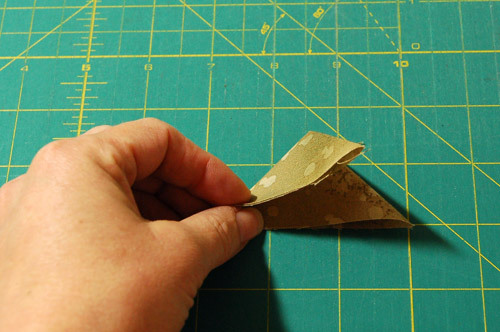 Fold each square in half diagonally. 3. And then in half diagonally again. All the raw edges will be sewn into the quilt. 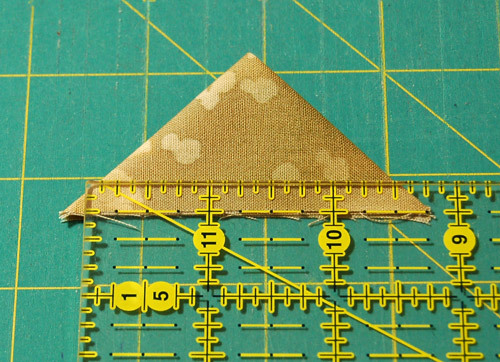 The width of your Prairie Point should be 2 1/2″ at the point where you would sew the 1/4″ seam. If you need to make the Prairie Points larger or smaller, simple cut squares that are 1/2″ larger than your desired finished width. 4. 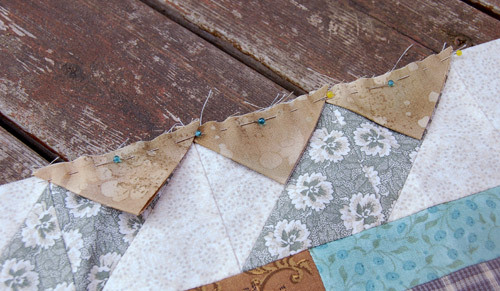 Pin or baste your Prairie Points to the edge of your quilt and stitch in place. I pinned these on because I am not going to put them on my quilt. After you have quilted the entire quilt, trim the backing to 1/4″ larger than the front of the quilt. 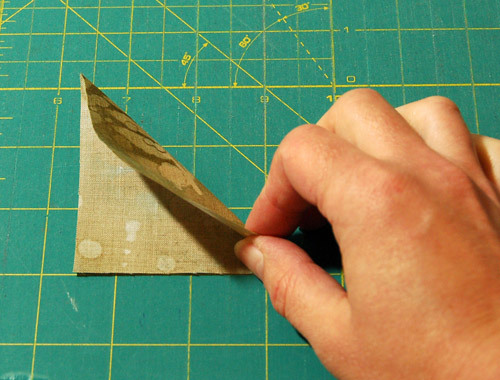 Also trim away any excess batting. Flip the Prairie Points towards the outside of the quilt and slip stitch the backing to the front to close up the quilt. There are a variety of ways to make Prairie Points, so let me point out a few links that I found out on the web. * You could fold your squares of fabric so that the opening is in the middle instead of on the edge. * Good photos on this site show the whole process of finishing the quilt. * You could overlap or nest the Prairie Points. In this method you start with the height that you want rather than the width. * You could make a continuous strip of Prairie Points. The only drawback would be that they will all be of the same fabric rather than scrappy. * Download a .pdf file demonstrating how to make a continuous band of Prairie Points from the Utah State University Cooperative Extension. * And… if you were wondering where Prairie Points came from, it is thought that they may have started as trim on undergarments in the 1800’s. Cool, huh? Thanks so much for the prairie point tutorial and the links. Great information. Too late for me. I already quilted and bound the big thing. I will try to post a finished photo on Sunday, but not today. One day… when I got the time… I must try to make a quilt. Thanks so much for this quilt along. I have sent my finished top to quilter. I plan to add the Prairie Points after she returns it to me. This was enjoyable to do and a learning experience! Eu adorei o tutorial. Super bem explicado. Vou deixar bem guardado até lá. 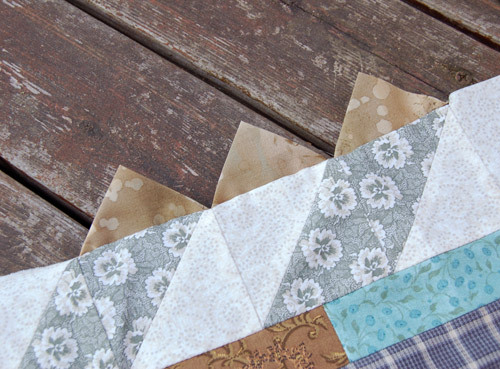 You are currently reading Medallion Quilt-Along – Prairie Points at Bloomin' Workshop.